The fourth installment in Sega's classic Virtua Tennis sports series. The game features 19 of the world's most popular players, including Nadal, Federer, Murray, Sharapova, Wozniacki and Williams. This installment of the series sees the introduction of the 'Match Momentum Gauge' feature. Build up your gauge over time as you stay true to the play style of your player. Then revel in your form as your player grows in confidence, allowing them to play shots mere mortals can only dream about. 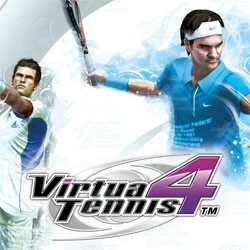 Virtua Tennis 4 also includes mini games that provide a fun alternative to the tournament mode for up to four players. The Virtua Tennis 4 board supports two players on one game board, but up to four cabinets can be linked together through the use of a Sega I/O kit. This installment of the series sees the introduction of the 'Match Momentum Gauge' feature. Build up your gauge over time as you stay true to the play style of your player. Then revel in your form as your player grows in confidence, allowing them to play shots mere mortals can only dream about. Virtua Tennis 4 also includes mini games that provide a fun alternative to the tournament mode for up to four players. The Virtua Tennis 4 board supports two players on one game board, but up to four cabinets can be linked together through the use of a Sega I/O kit.